Opportunities for education were limited in the eighteenth century. Many children were employed six days a week in such establishments as local cotton mills leaving Sunday the only day on which they could receive basic education as provided by a number of Sunday schools. The Grammar school existing at the time in Friars Walk, taught the ‘classics’ such as Latin, Greek and English. Any other form of schooling was private. In 1728, Allsopp’s charity school was founded by Richard Allsopp, a Burton mercer, who bequeathed £10 a year for the instruction of 30 poor boys from Burton. Some were also clothed by other charities, such as the Francis Astle foundation, which donated a princely £5 a year for the purpose upon the death of his wife. Education for girls was generally considered unnecessary. A girl did however, first enter the school in 1785 and a second in 1787. At this time, there were around 23 boys. The number of girls gradually grew. In 1834, the school was moved to New Street. At a time when the ‘National Society for Promoting Religious Education’ was busy establishing National Schools in England and Wales. It too had recognised the need to provide basic education for the poor with the three R’s (Reading, wRiting and aRithmetic) being taught in conjunction with religious education. 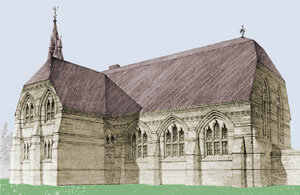 The first National School in Burton was attached to Christ Church in New Street, opened in 1844 providing for 120 boys, 120 girls, and 100 infants. The largest school in the town by far! ( Pictured ). 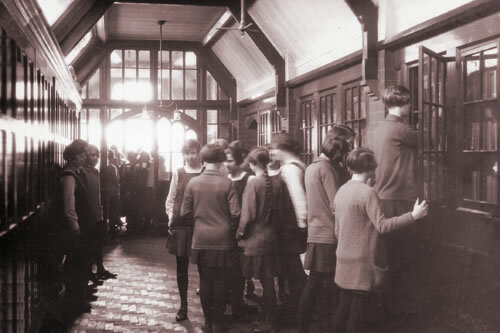 A few years later it was sharing its premises with Allsopp’s Charity School and was extended. (Christ Church received much damage including a cracked spire as a result of the Fauld explosion in 1944 and had to be demolished). The Education Act of 1870 led to the formation of The School Board in Burton in 1873. As part of a major redevelopment and re-organisation, which included much new building of schools, Burton Grammar School finally made its long overdue move from Friars Walk to a newly built school in Bond Street in 1877. Ironically, Saint Modwen’s church acquired the vacated school for use as a Sunday school teaching the scriptures. Within the next few years, new schools were also built in Victoria Street, Wetmore Road, Grange Street, Uxbridge Street, Wellington Street and Broadway Street. 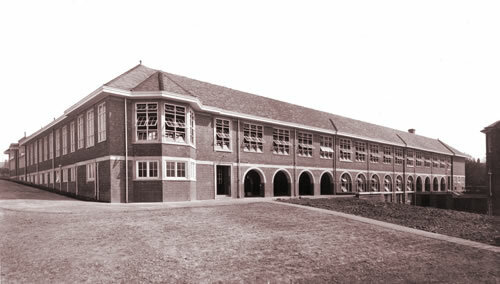 The Girls’ High School was to eventually find an impressive new home in Winshill in 1928, an influencing factor in the selection of site of the Burton Grammar School almost thirty years later. This meant that for an almost 30 year period, Girls in Burton-on-Trent enjoyed much better education facilities than boys.